This was to be quite a different “one off” job, unlike the usual jungle clearance and embankment. Wang Po is at the 113 km mark, and when we reached it in early 1943, was quite a new camp, the rains had not started and the camp was quite dry and fairly clean. We were by now dying off quite frequently but not more than one or two each day and we were still on two bowls of rice per day, not one. 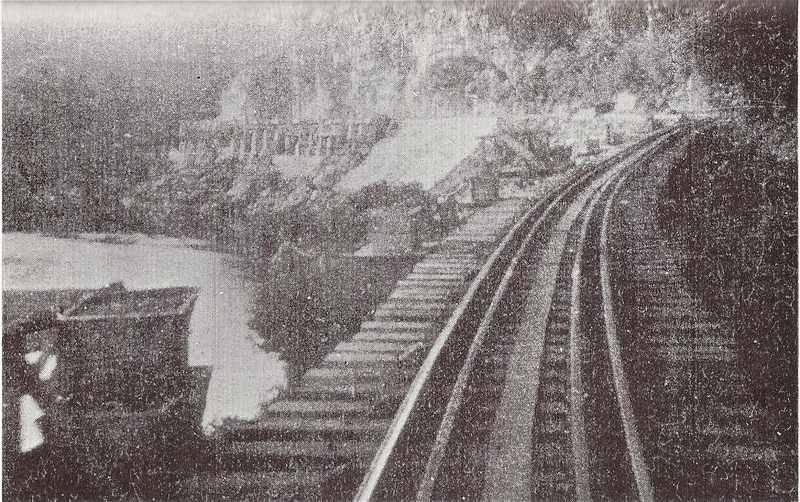 … near the village of Wang Po the river makes a sudden eastward loop into a rocky gorge that cuts into the line of the railway and here it was necessary to build a viaduct about half a mile long to carry the rails over the gorge beside the river. Our camp was set up on the west bank, opposite the working site as the gorge made it impossible to build a camp on the east bank. The camp was located on the edge of a forest of teak trees, which were to be the source of timber for the construction. We were a big group, a thousand or more I think… . One half of the group worked on the trees preparing the beams, the rest, of which I was one, worked in the gorge. Our first job was to clear rocks and boulders from the planned route of the viaduct, which we did by drilling and blasting. The holes were made with a rock drill. One brave man holds the drill while two others smite the head of it with sledgehammers. We Linemen were used to sledgehammer work and did not often damage the hands of the drill holder but some of the other parties suffered several damaged or broken wrists. There was no power machinery of any sort in the whole construction, just hand tools. By the time of the midday tea break our holes had generally gone in deep enough, and while we rested and drank our tea (no midday rice now), the Japanese engineers packed the holes with plastic gelignite and set detonators and lengths of safety fuse in them. There might have been as many as fifty blasts set off at once and it was important, both for us and for the Japs, to make sure they all went off. In the afternoon we shifted all the broken rocks and carried them down towards the riverbank. When all the boulders had been cleared we set about making the concrete foundation piers, all built by hand with hand mixed concrete. … which had to be carried to the site on the usual rice sack stretchers. Wet concrete makes a very heavy load. The Japanese engineers had already set up wooden shuttering for the piers… . I should have mentioned that we had to cross the river from the camp to the site, morning and evening, but as it was in the dry season the water was quite shallow and you could walk on the bottom most of the way and only had to swim in the middle. While we were clearing the rocks and building the piers, the other half of the group were felling teak trees. Very tiring work, as fresh teak is extremely hard. The trunks when felled were cut to length and then squared up by Japanese engineers using an adze. I have seen one of their engineers square up a log fifteen foot long and around two foot thick in one morning’s work. When the concrete piers were nearly finished, 27 Line Section and others rejoined the timber party and started the very heavy task of carrying the squared timbers down to the riverbank. 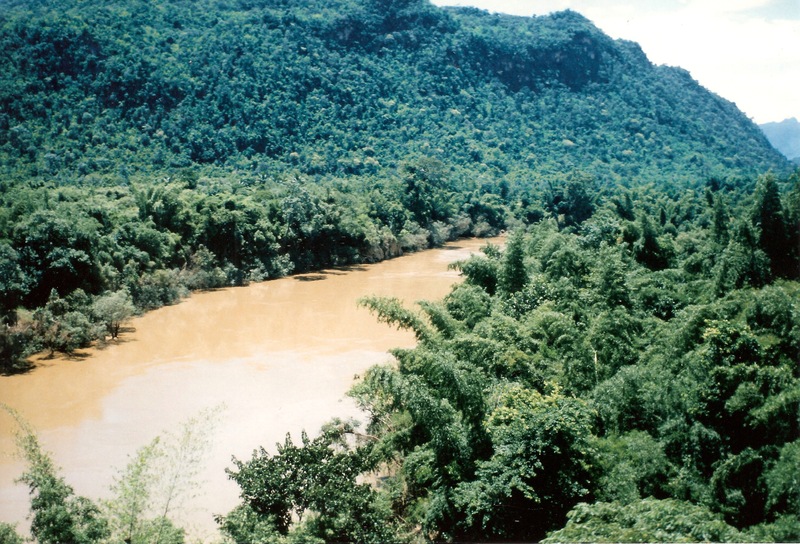 The intention had been to float them across the river but some of the POWs who had worked in the Burma teak forests insisted that green teak is so dense it will not float. The Japanese were unconvinced but the first trial proved the point. From then on we swam the beams across the river fastened to bundles of bamboo to keep them afloat. A few elephants with their Burmese mahouts helped in this work of shifting the beams down to the river but they were the only powered machinery on the job. They seemed extraordinarily precise, even fussy, in their handling of these heavy loads seemingly without any orders from the mahouts. There were not enough of them, of course, and we had to do much of the carrying ourselves. I reckon these beams must have weighed around 3/4 of a ton (or tonne) each, more or less, depending on their length. At first we tried to get them up on to our shoulders like undertaker’s men with a coffin. But the edges were too rough and sharp, so instead we used the ever-present bamboo poles. Eight or ten stout poles pushed under the beam and then lifted with one or two men at each end and the beam could then be carried down to the river looking like a giant caterpillar. There were no cranes, simply intricate bamboo scaffolding fastened onto the rocky cliffs above the site and multi sheave pulley blocks fastened to it. A long rope over the pulleys with 50 POWs tailing on to it served to raise each of these beams into its proper position, where they were then all fastened together with dog spikes. When the trestles were in place, held up by more bamboo props, then the even heavier horizontal beams which connected them together had to be heaved up into place by the same method and then spiked together. With the crudest estimate there must be between 500 and 1000 beams in the viaduct. While we were doing this other groups of POWs had laid sleepers and rails on the prepared embankment and were ready to go on over our viaduct as soon as each section was completed. [The next section of the Railway had already been completed, so] we POWs who had built it were actually carried forward for a short section of our next march in railway trucks over the viaduct. I remember it as a very scary proceeding. The train went at a walking pace and at each rail joint, with its sudden change of direction, we felt that the wheels might easily jump the track and tumble us all down into the River. We got over without incident but I heard that the engineers kept a working party permanently on the viaduct with crowbars to lever bogey wheels back on to the rails if they came off. I have to admit that when this job at Wang Po was finished we POWs felt a certain mixed up pride in the work. We could see the completed viaduct and it worked and we had built it ourselves without mechanical aids of any sort beyond hand tools and a few elephants. I was left with a great admiration for the skill and planning ability of the Japanese engineers and an ever-growing bitter hatred for our guards. This entry was posted in POWs, Writing notes and tagged Far East POWs, Researching FEPOW History, Royal Signals, Thailand, Wampo Viaduct by hilarycustancegreen. Bookmark the permalink. This is an awesome story, Hillary and the photos put everything into prospective. I am slowly (!) writing a narrative about his life. Thanks you for the informative blogs!!! Thank you for dropping in. I have been to your blog and read your amazingly detailed and moving account of the months after your father’s return. I have at least one of his books (not yet read) in the collection of FEPOW material I am working through. I haven’t seen the movie, I shall try to find it. I am only editing the collection of materials I have from the period, together with excerpts from my father’s memoirs, but that too is a slow process. My maternal grandfather (who raised me as his adopted son) worked on the Wampo viaduct. Although he was strictly an anti-racist and a very generous person, when he was on his deathbed in 1986 I learnt that he had not forgiven the Japanese because of appalling events he had witnessed out of the culture clash that the film ‘To End All Wars’ portrays. Like most who made it back, his weight was down to 7 stones, he’d lost all of his teeth and he was completely grey haired at 35yrs old; having had dysentery, beriberi and twice malaria. In my teens, I once asked him what was the worst that had happened to him and he replied, “A Japanese guard walked up to me one day on the railroad. He spoke good friendly English and showed me some photos of his wife and children and I complimented him on his family. He asked me if I had family and I said I had a wife and a son and daughter and showed him my photos of them. He said, ‘You’ll never see them again’ and walked off. I said to him, ‘I will'”. Chance being often the decider, he was next to step onto the boardwalk to one of the Hell-ships when further boarding was aborted due to an allied air-raid. The ship sailed and was sunk by the allies. On another occasion, he’d been comforting a man who was dying of Cholera by holding a cigarette for him to drag on and was in the unthinking act of bringing the cigarette to his own lips when a passing brigadier swiped his hand away, calling him every kind of fool. In one period before the surrender he’d been on regular night-time machine gun duty and was given a night off and his replacement was killed that night. The jap guard was proved wrong by chance as much as, if not more than, anything else! Thank you for your Wampo blog, which has brought ever more respect for all who were there. Hello Stephen, the legacy of those years was impossible to erase, and I saw the effects all the way through to my father’s death (in 2009). Yet he was one of the lucky ones, not only born in Malaya and so familiar with the peoples and climate of the region, but also a survivor with few health problems and a family he could talk to. Your grandfather sounds like a great character. To make it through you had to be very tough, lucky and have good mates – if you missed out on any of those aspects, you never came home. Thank you so much for telling us about his experiences, they deserve to be remembered. This year I will be concentrating on my book about the families of the 69 men all POWs in the Far East from 1941 to 45.